Robert E. Lee has arrived on the battlefield. He is shown here on the Cashtown Road where it crosses Herr’s Ridge – the Herr Tavern and barn are seen in the background. Ambulances whisk away the wounded and dying of Heth’s Division, which had opened the attack that morning. Heth rides up with four of his staff joining Lee, General A. P. Hill (who is clearly irritated with Heth for bringing on an engagement contrary to Lee’s orders), and Lieutenant Colonel Walter Taylor, Lee’s cigar smoking aide. While Heth solicits Lee’s permission to renew the attack, his men reorganize in preparation. 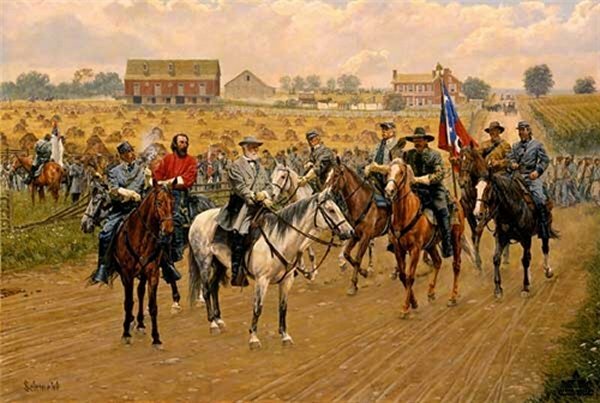 Lee was "not prepared to bring on a general engagement today” because General James Longstreet’s corps had not yet reached Gettysburg. But Lee sees a cloud of dust beyond the Federal XI Corps’ right flank; General Jubal Early’s division has arrived on the battlefield. An opportunity has presented itself to the Confederate Army commander. With the long, discontinuous Federal line bent at a right angle, and with Early assailing the Union right and General Robert Rodes hammering the angle’s vertex, A. P. Hill’s corps could renew its assault against the Union right and the enemy would be caught in the jaws of a vise.